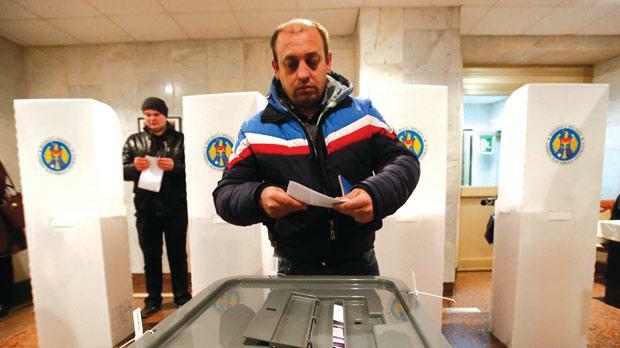 A man casting a ballot during a parliamentary election at a polling station at the Moldovan embassy in Moscow, Russia, yesterday. 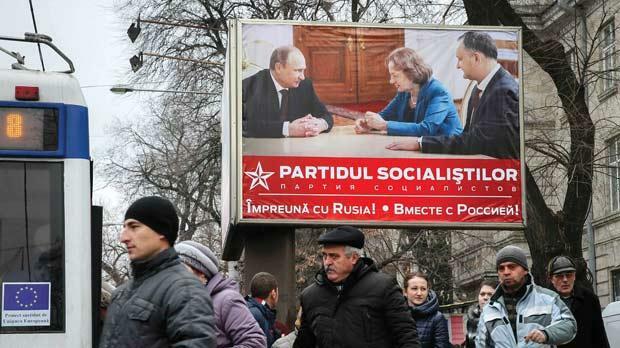 Ex-Soviet Moldova voted yesterday as polls showed the outcome might slow, though not halt, its moves to shift towards the European Union and away from Russia, which has hurt its economy by banning its wines and other prime exports. Surveys show public opinion in one of Europe’s smallest and poorest countries is divided over whether to stick to the pro-Europe path pursued by the ruling centre-right coalition or reverse course and join the Russia-led economic bloc. Moldova’s breakaway pro-Russian enclave of Transdniestria gives Russia a potential springboard, but Moscow has so far shown no readiness to intervene as it has done in Ukraine, which has also pursued a pro-Europe agenda. In pre-election opinion polls, the communists came in as a front-runner at 24 per cent and the three pro-EU coalition parties, including the Liberal Democratic party of Prime Minister Iurie Leanca, together at 38 to 43 per cent. Moldova’s communist opposition leader, former president Vladimir Voronin, supports integration with Europe, but he also aims to revise the trade part of an agreement with the European Union to protect domestic food producers from being overwhelmed by EU competition. He also aims to improve relations with Moscow, Moldova’s big energy provider, though he has been on poor terms with Russia since turning down a deal on Transdniestria a decade ago. The parties need to gain at least six per cent of the vote to win seats in the 101-seat parliament. A simple majority is required to form a government. No exit polls were planned, but early results were expected during the night. With the far-reaching political and trade deal with the EU bloc ratified and with Moldovans now enjoying visa-free travel to western Europe, commentators say it is difficult to imagine any new leadership gaining popular support for a U-turn back towards Moscow. Russia has shown its displeasure by banning imports of wines, vegetables and meat from the landlocked country of 3.5 million wedged between war-torn Ukraine and EU member Romania. A strong showing by the anti-EU socialists could complicate Moldova’s shift towards Europe. Their leader, Igor Dodon, is close to Russia’s Vladimir Putin, and the party favours membership of a Russia-led customs union.